Project HAYABUSA was a UNSC powered armor program developed independently from, and as a rival to Project MJOLNIR. The program later produced a MJOLNIR variant for the Mark VI generation. The Hayabusa armor's advanced materials decreased its weight by nearly one-third, and was aesthetically designed after ancient Japanese samurai armor. It includes spiked shoulder pauldrons (correctly referred to as s'ode). The Hayabusa armor's helmet was designed with a defensive and ultraviolet-protective visor. 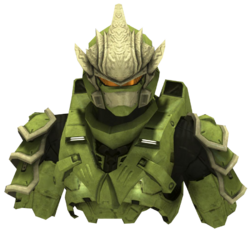 Like all UNSC helmets, the visor is the weakest part. Thus, a small visor was designed to be more difficult to accurately penetrate. As such, the small visor provides for better protection of the wearer as well as better camouflage. The Hayabusa was designed with greater emphasis on heavy lifting and extra-vehicular activity than the MJOLNIR. It is slightly slower and less dexterous than its MJOLNIR counterpart, though it is nonetheless highly effective and possesses most of the design features of the MJOLNIR Mark VI. The Hayabusa is a powered battle armor system, similar to the MJOLNIR armor, except stemming from Project HAYABUSA as opposed to Project MJOLNIR. It was developed by the RKD group, an Earth-based think tank, in the year 2536, fifteen years before the MJOLNIR Mark V entered production. It was presented to the UNSC Ordnance Committee as an answer to the self-contained powered armor problem. Originally, RKD developed Project HAYABUSA without knowledge of the classified Project MJOLNIR. After contacts were made between RKD and ONI's Materials Group, the two pooled their research resources, resulting in the creation of a MJOLNIR-compatible HAYABUSA variant. Featuring a number of stylistic and functional improvements, it became a crucial piece of hardware in the later years of the Human-Covenant War. Description: The critical innovation brought about by RKD's involvement in the development of power armor is in the use of advanced materials-reducing the weight of current generation armor by nearly a third. The helmet features seven angular spikes, one to each side, and the face plate is fused into a single piece and contour. The top rear guard of the helmet is pointed, revealing a protruding spike. The bottom rear, around the neck, forms a neck guard, like that of a samurai helmet. The seven spikes are always silver-white regardless of armor color. Clips can be seen on the side of the helmet. Description: Although the two projects were developed wholly independent of one another, projects HAYABUSA and MJOLNIR mirrored each other in many ways. Its shoulder pauldrons are replaced by three metal plates arranged in an overlapping fashion similar to the armor of a Japanese samurai, also known as the "sode". Description: In late 2536, RKD -an Earth-based think tank- presented the UNSC Ordnance Committee with the answer to the self-contained powered armor problem: Project HAYABUSA. The chest armor features a thick, round collar piece protecting the neck, as well as an angular strip of armor that appears to be strapped over the chest, featuring a small delta in the center. The Hayabusa armor bears a resemblance to the armor worn by feudal-era samurai. The armor is named after Ryu Hayabusa, the protagonist of the Ninja Gaiden series and a combatant in the Dead or Alive series. The helmet is almost an exact copy of the "ninja of the future" costume in Ninja Gaiden on the Xbox. Bungie likely created the Hayabusa armor as a tribute to Team Ninja for adding Nicole-458 into Dead or Alive 4. Team Ninja, the developers of the Ninja Gaiden series and Dead or Alive series, are mentioned in the credits for Halo 3. Hayabusa is Japanese for "peregrine falcon" and is also the name for an unmanned space mission conducted by the Japanese Aerospace Exploration Agency that returned to Earth on June 13, 2010, and the Nakajima Ki-43-III-KAI fighter craft flown during World War II. SHINOBI-class Mjolnir is considered the spiritual successor of Project HAYABUSA. A flaming Hayabusa helmet, triggered by the Bungie employee-only chest plate. Hayabusa with katana. Available upon unlocking 49 of 79 achievements. Front and back renders of the Hayabusa armor in Halo 4. Angled front and back renders.